On a day off in January 2014, Dan and I took a road trip north to try and find a few drive-ins. Our luck was high, because we were able to visit 2 former drive-in sites. The Shore Drive-In and Fly-In Drive-In were 4.4 miles apart on Rt. 34 in Wall Township. The downfall of our visit was that it had snowed prior to our visit, making it difficult to capture pictures of what remained for the Shore Drive-In. The site is not easily accessible, especially in the snow. There are many speaker poles remaining, outlining the parking spaces and lanes for driving. On May 12, 1948, the Shore Drive-In of Farmingdale*, NJ opened with the support and praise of various local businesses and residents. The Asbury Park Press newspaper (May 11, 1948) is littered with advertisements congratulating the Eastern Drive In Theatre Corporation on the opening of the Shore Drive-In. Supporters included Bell Supply Co, Drive-In Refreshments, Thomas Nicol Co, Jersey State Electric, Franklin Engineering, Monmouth Lumber Co, Anchor Post Fence Co, and many more. Most notable was the support and recognition from the Park-In Theatre Company. The Park-In Theatre Company was Hollinghead’s company, the original creator of the Drive-In Theater. 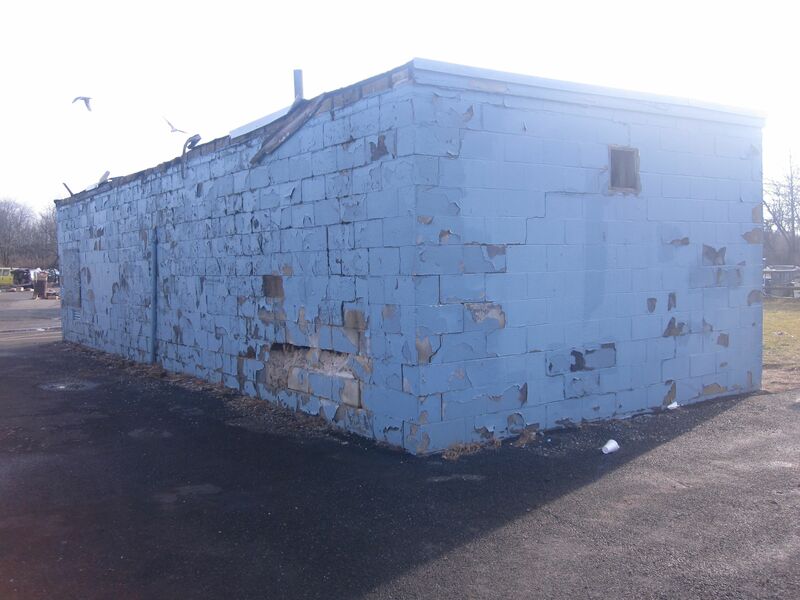 The Shore Drive-In was covered and license under the Hollingshead Patent for drive-ins. Some interesting features for this drive-in included complementary bottle warming for mothers with young babies, in addition to the usual amenities offered by drive-ins. 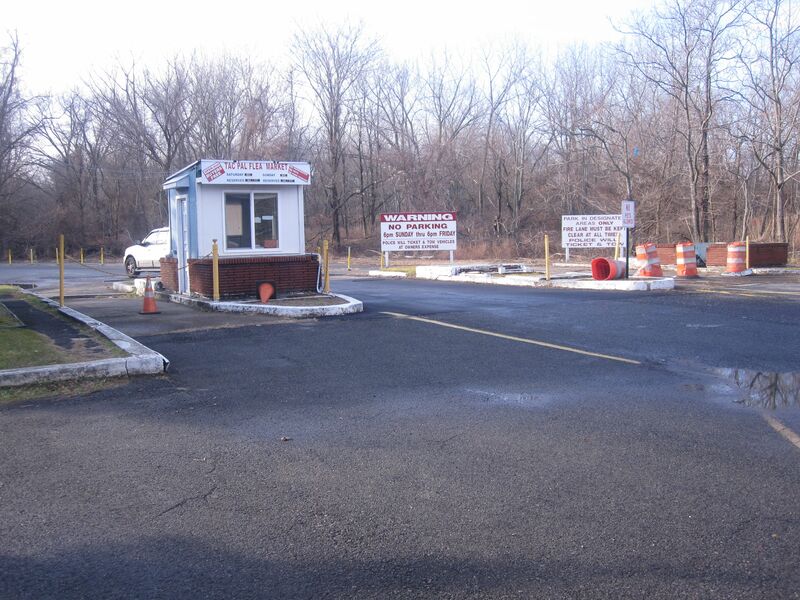 Research of Eastern Drive In Theatre Corporation and James J. Thompson (owner) led to very little, except that they owned and operated several other NJ drive-ins including the Union DI (where the original moved after 3 years), Morris Plains DI and Totowa DI. However, the corporation and drive-in search did connect to Wilfred P. Smith. Wilfred P. Smith was the general manager for Eastern Drive-In Corporation through 1950, having a hand in all of the beginning drive-ins in New Jersey, including the Shore Drive-In. He obviously took pride in the presentation and reputation of the drive-in, for he is quoted saying they were “striving for another NJ State Garden Club award such as was presented to our Union Drive-In Theater last year for landscaping, beauty, safety and civic achievement for a business enterprise along a main highway” (Asbury Park Press, 1948). Smith left Eastern Drive-In Corporation to open his own drive-in in Ledgewood, and subsequently the Newton Drive-In. Although I was unable to find a lot of history on the Shore Drive-In, I was excited to be introduced to Wilfred P. Smith and his pioneering efforts. Hopefully he enjoyed the retired life, and his memory will live on in the drive-in world. The Shore Drive-In closed sometime after 1979. The screen was demolished in 2001. *Depending on where you get your information, the Shore Drive-In may be listed as Collingwood Park, Wall Township, or Farmingdale. It was near Asbury Park, but not in that town. 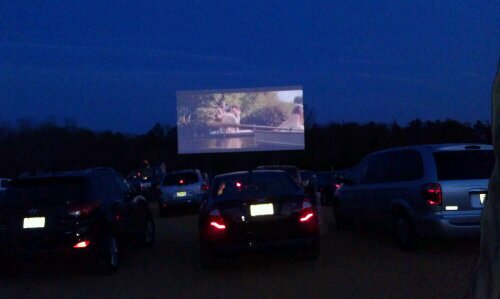 January 12 was our “drive-in hopping” day. We visited 4 former drive-in sites that day! 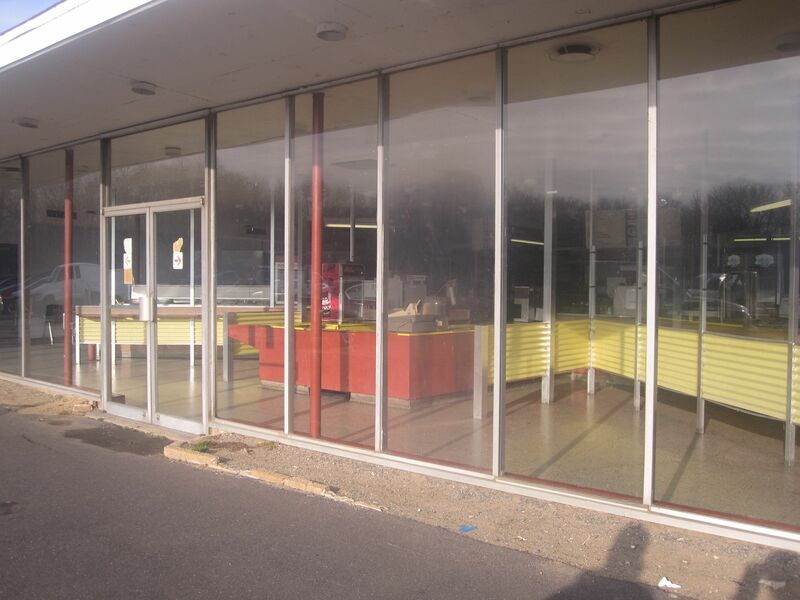 This had the easiest access since it is open and operates as an outdoor flea market. 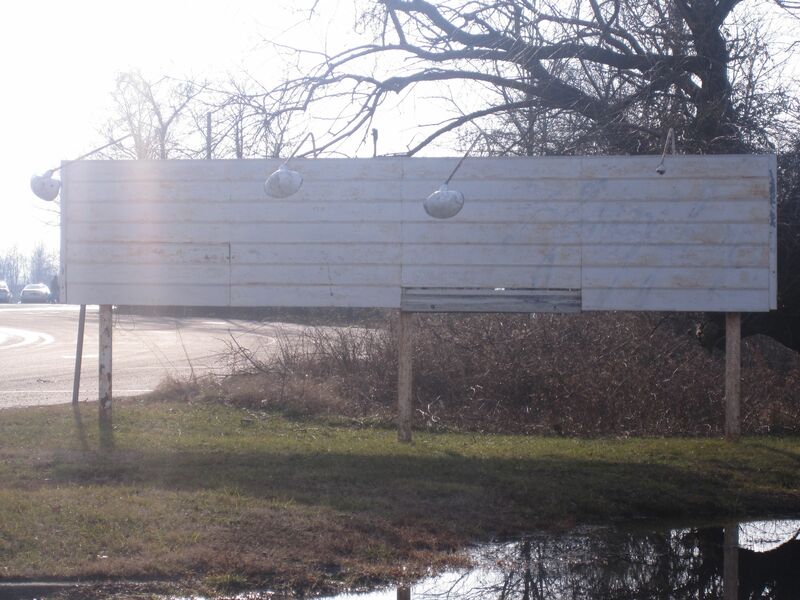 As you pull into the driveway you meet the marquee, a ticket booth, and another small building. 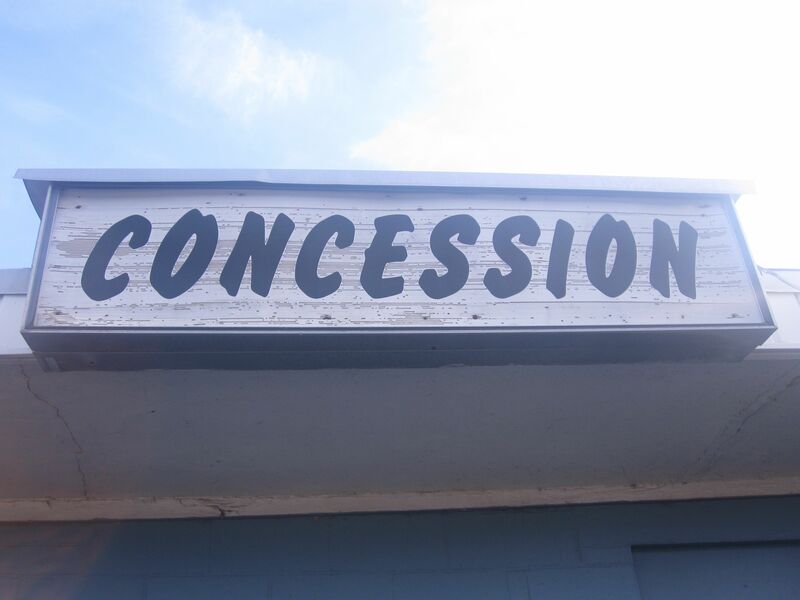 We walked around a chain-link fence to get back to the ticket booth and other building. First, let me say it is awesome that those who own the property have left these buildings. Whether it is for nostalgia, aesthetics, or cheaper than tearing them down, I’m happy they were there! 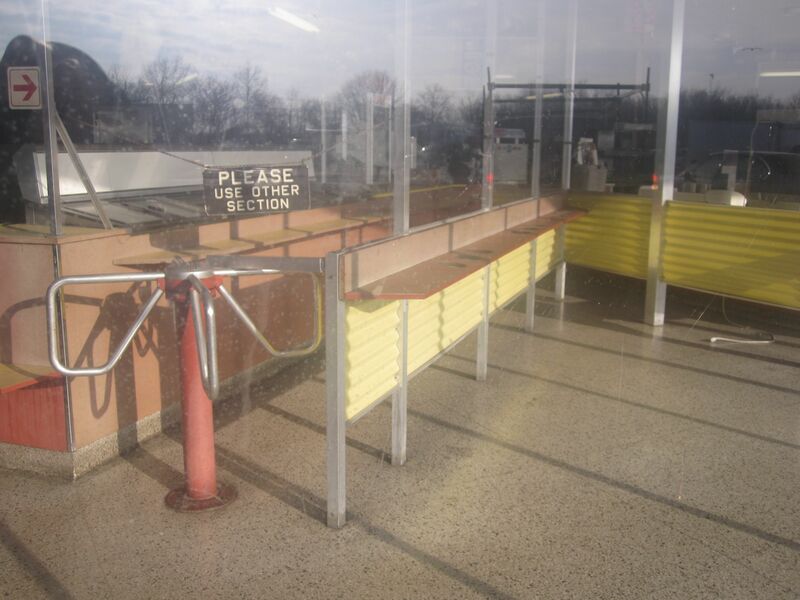 The ticket booth advertises the hours of the flea market, boosted a foot above the drive-way on a curb. The bottom part is made of brick, while the rest of the booth is cement. 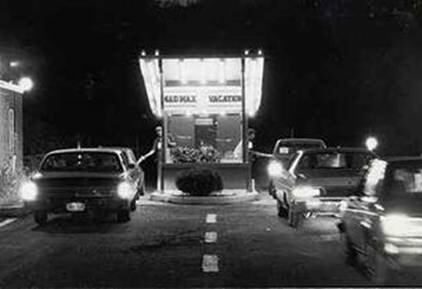 Similar to the Delsea Drive-In (Vineland, NJ), it seems that cars could approach the booth from either side to purchase their tickets for the evening, and this is confirmed from a photo taken in 1985 (seen at the end of this post). Current access to the flea market is on the right side only. An interesting tidbit is a metal piece found in the ground, to the left of the ticket booth. 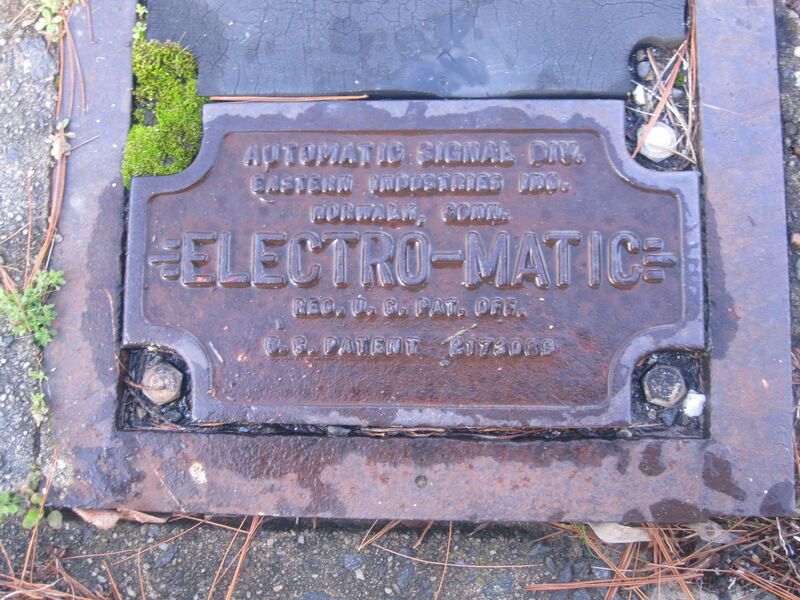 The name across the center is “Electro-Matic.” There is also a metal box atop a pole to the left of the Electro-Matic. 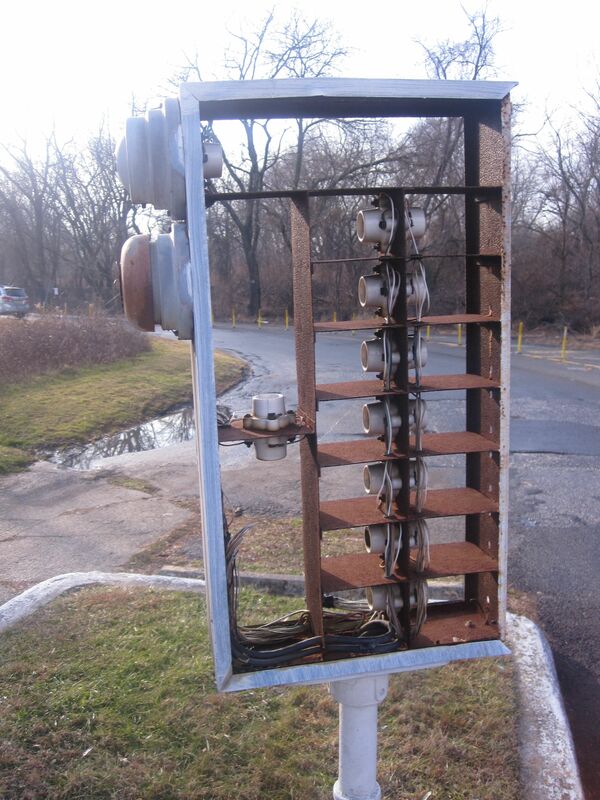 With some quick research, it seems that the Electro-Matic and empty metal panel was part of a traffic-control system. 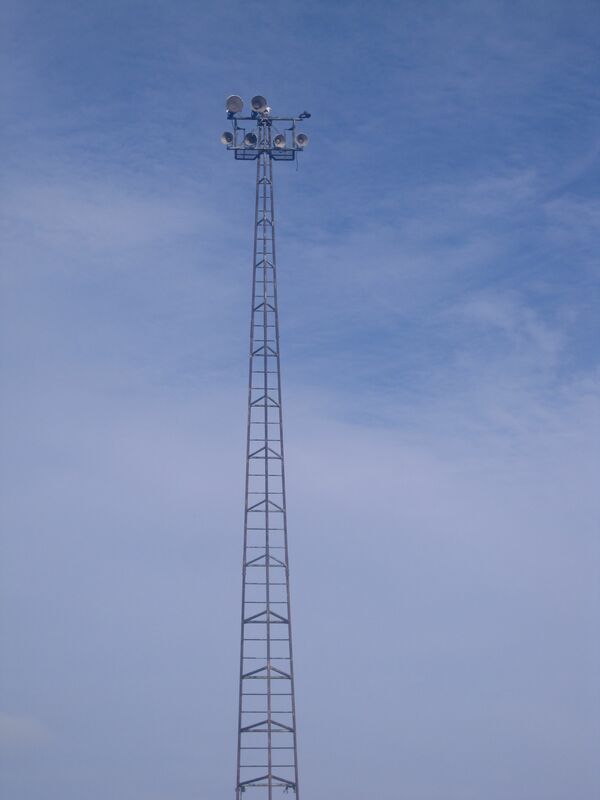 These are usually used for automated traffic control, such as traffic lights and railroad systems. The earliest print ad I was able to find was 1954, putting it in the timeframe of the drive-in. However, the ad does not depict the empty panel present at the drive-in. The panel seemed to hold several light bulbs. When discussing what I discovered with my boyfriend, he suggested that there might have been an automated gate that would rise when a car released the sensor. Another thought was that the Electro-Matic signaled a light for the ticket-seller to know someone was present. These are just guesses, of course. I have not found any concrete evidence of its use. 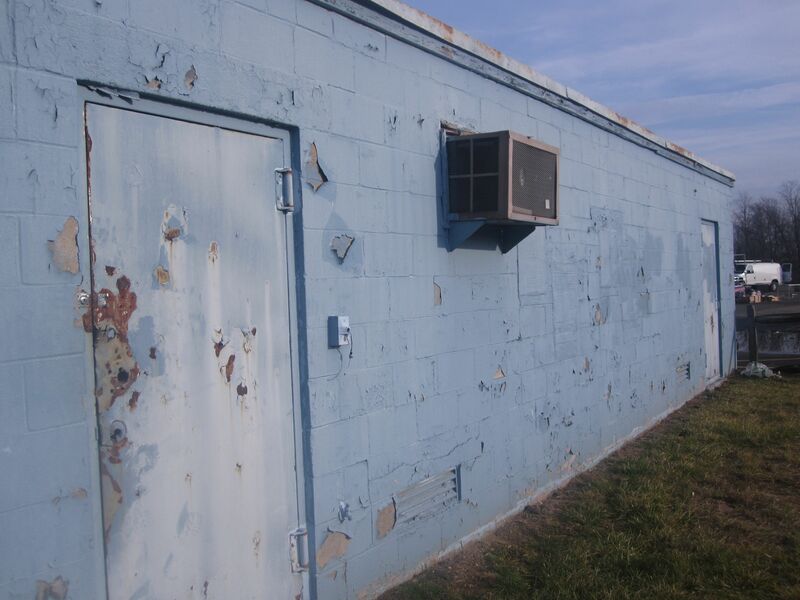 The projection booth still stands as well, with peeling paint and an overall decrepit appearance. Finally – the grading of the now parking lot is a testament to what the place represents for many people. 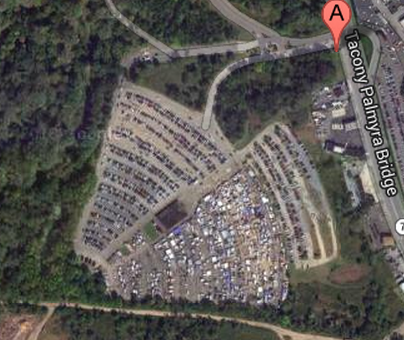 What used to be parking for the movie now is used for parking for the flea market, as well as space for the vendors. Take a look at the aerial view and there is no doubt what used to be here. 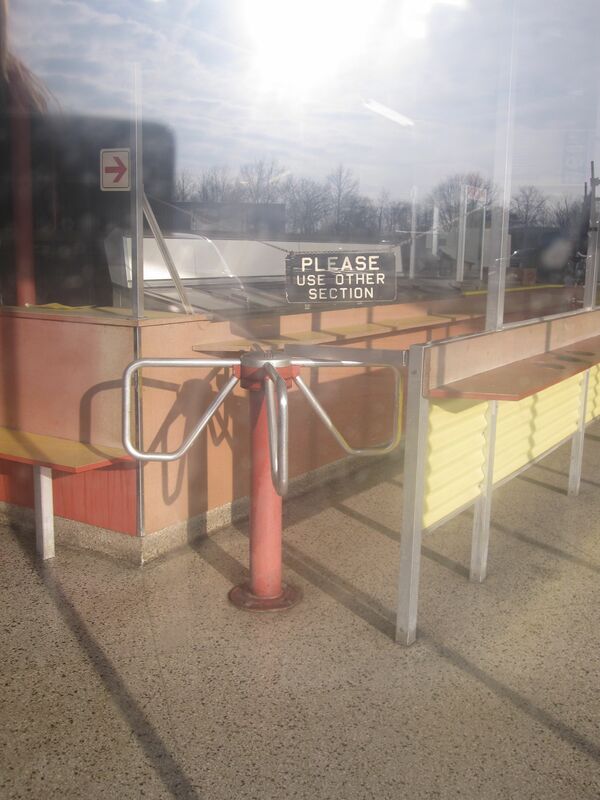 Although the screens are no longer standing, it was really neat to see the remnants of the Tacony-Palmyra Drive-In. The Tacony-Palmyra Drive-In Theatre opened in 1957. 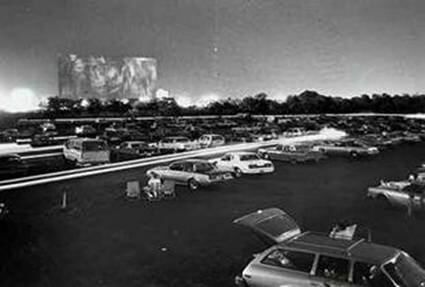 Shortly after (date unknown) another drive-in opened no more than 6 minutes down the road (Pennsauken Drive-In). Drive-ins were highly popular in the 50s and 60s, then started to decline. One person has posted that the drive-in was open in 1954 because of a movie listed on the marquee; however, I have not found any evidence of it opening prior to 1957. The movie being shown later is quite possible since drive-ins were not given priority or rights to “A-list” movies when they were released. 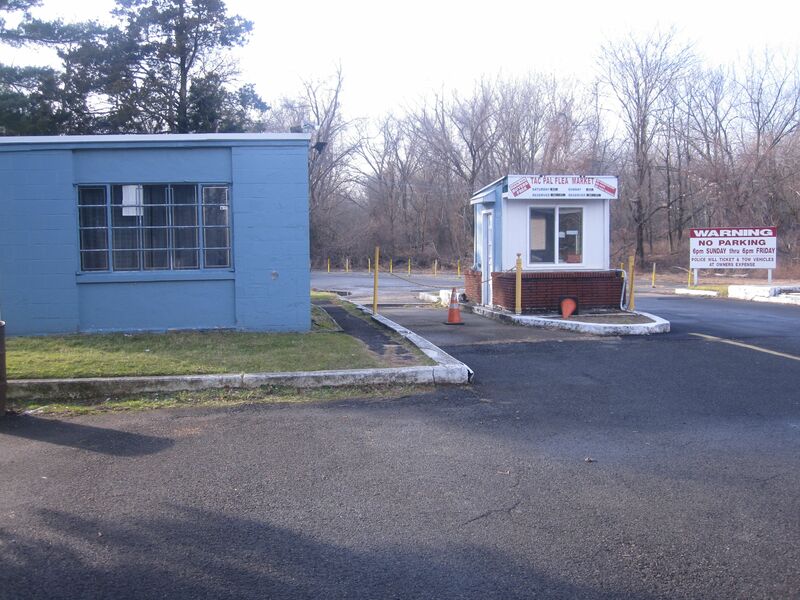 The Tacony-Palmyra Drive-In was at the base of the Tacony-Palmyra Bridge, that connects New Jersey to Pennsylvania (specifically, Philadelphia). This allowed easy access for residents of both states (although PA had plenty of drive-ins as well!). The drive-in had two screens at the end, but began as a single-screen theatre. 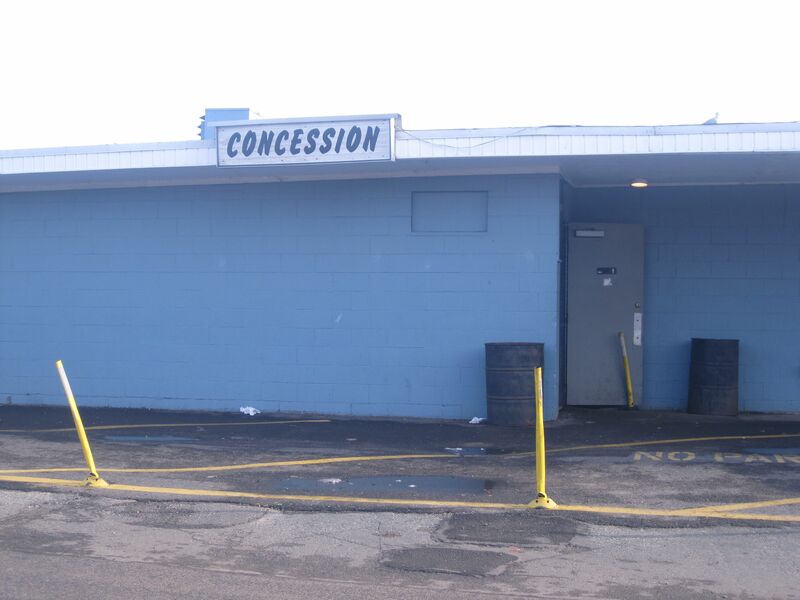 National Amusements owned the drive-in and added the flea market towards the end of the drive-in run. The drive-in closed in 1986, but the flea market has continued on ever since. 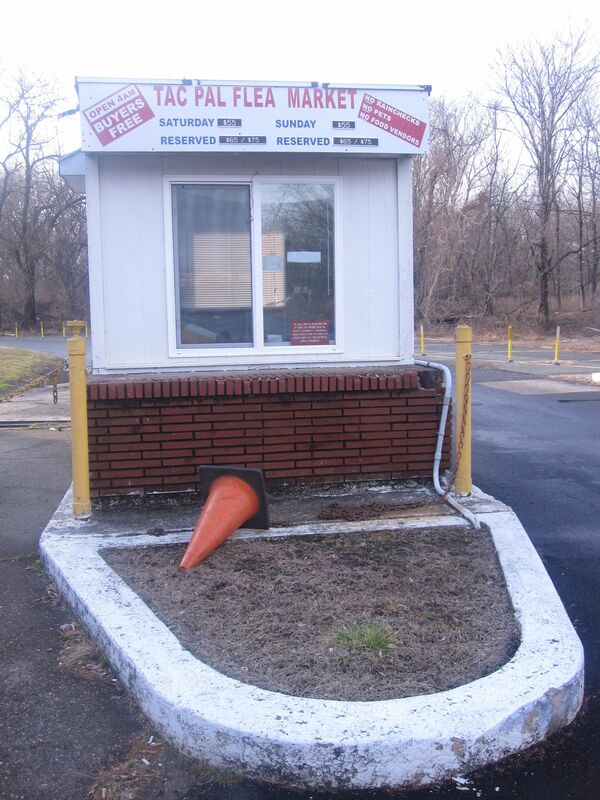 There was a short closure of the flea market when WWII shells were discovered underground in 2008. The screens were taken down at some point after 1998 since the following article says that they were present when the article was written (http://archives.citypaper.net/articles/071698/cover.side.shtml). Unfortunately, I will not be attending opening weekend due to prior engagements; however, I am excited for Drive-In season to begin. 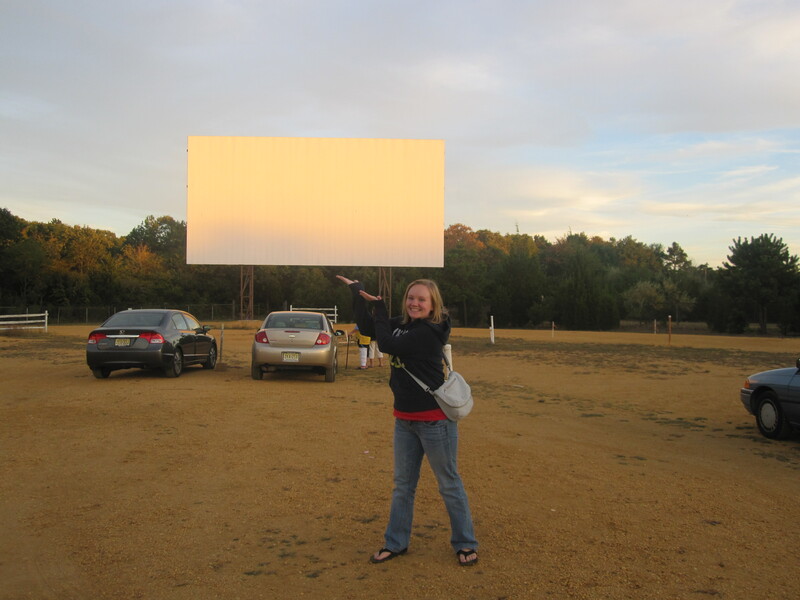 My next update will be about my very first trip to the drive-in… I can’t believe that was over 2 years ago! Cheers to a great season! Flash-forward and it is 2 1/2 years later, April 2013. I now own 3 books about drive-ins, I have a bookmarked folder for websites/links, and a goal to visit as many drive-ins as I can. And not just drive-ins that are open, but those that have left remains behind. This blog is a way for me to share my explorations, my findings, my enthusiasm. Who knows…maybe you’ll catch some drive-in nostalgia too.